Consistent expectations that ensure MHP students are both nationally and internationally competitive. Madison Highland Prep’s thorough understanding of the Arizona State Standards for high school resulted in MHP’s selection of the College Board’s Spring Board curricular materials as the foundation for its English curriculum. The Arizona State Standards for English Language Arts are organized by shared bands in high school (i.e., grades 9-10 and 11-12). Each performance band contains vertically articulated “Anchor Standards” for reading, writing, speaking, and language. SpringBoard has a web link that provides highly specific examples of its ELA alignment to the Arizona College and Career Ready Standards available at: http://springboardprogram.collegeboard.org/commoncore. SpringBoard adds value to the Arizona State Standards through its strong emphasis on reading analysis, writing in multiple modes, vocabulary acquisition, and language usage that build from basic language acquisition through effective use of rhetoric and complex syntax. MHP students will take four years of English courses. Freshmen and sophomores will have the opportunity to take English Honors courses. Juniors and seniors will have the opportunity to take AP English courses in composition and literature. Madison Highland Prep’s thorough understanding of the Arizona State Standards for high school resulted in MHP’s selection of the College Board’s Spring Board curricular materials as the foundation for its Mathematics curriculum. The Arizona State Standards are organized by the following categories: Number and Quantity, Algebra, Functions, Geometry, Modeling, Statistics, and Probability. These conceptual categories show the body of knowledge students should learn in each category to be college and career ready, and to be prepared to study more advanced mathematics. Again, SpringBoard has a web link that provides highly specific examples of its Mathematics alignment to the State Standards available at: http://springboardprogram.collegeboard.org/commoncore. MHP students will take four years of Mathematics courses. Freshmen will take on credit of Algebra 1 and will have the opportunity to accelerate into Geometry based on demonstrated achievement in Algebra I concepts. Sophomores will take Geometry and have an opportunity to accelerate into Algebra 2 and Probability & Statistics. Juniors and seniors will take Algebra 2, Trigonometry, and Probability & Statistics. Juniors and seniors will have an opportunity to take dual enrollment courses for college credit in College Algebra, Pre-Calculus, and Calculus. 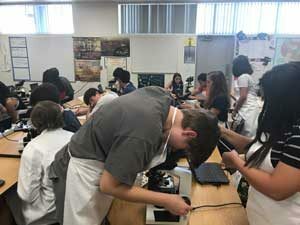 Madison Highland Prep’s curriculum for Science will be aligned with Arizona’s State Standards and literacy will be infused across the curriculum. MHP will ensure literacy and connections to the Arizona Science Standards through secondary alignment with the Next Generation Science Standards (NGSS). The NGSS were designed to reflect the increasing need “for scientific acumen in a complex, technological world”, and the “emphasis is on demonstrating the scientific process.” (Schachter, 2013) The aim of the science program will be to provide students with discovery and experiential based learning, the development of background knowledge and skills, and a deep understanding of physical science. Students will use discovery and experiential based learning to discover the rules and principles that guide physical sciences. MHP will ensure that the lab component of its science curriculum supports a seamless transition to any college or university program. MHP students will take three years of science courses, although four years is suggested. Students will take Chemistry during their freshman year, Biology during their sophomore year, and Physics in their junior year. Students will have an opportunity to take AP courses in Environmental Science, Chemistry, and Biology in their junior and senior years. Madison Highland Prep’s curriculum for Social Studies will be aligned with Arizona’s State Standards and literacy will be infused across the curriculum. The aim of social studies program will be to promote civic proficiency; that is the knowledge, intellectual processes, and democratic perspectives required of students to be active and engaged participants in public life. Civic proficiency depends on a commitment to democratic values, and requires the abilities to use knowledge about one’s community, nation, and the world to apply discovery processes, data collection and analysis, collaboration, decision-making, and problem-solving through the examination of primary source and secondary source documents. MHP will encourage its students to become educated, global citizens, with a social conscience, who will be able to serve as change agents in their local and global community. MHP students will take three years of social studies courses. Students will take World History during their freshman year, United States History during their sophomore year, and Government and Economics during their junior and senior years. Students will have an opportunity to take AP courses in United States History in their junior year and Microeconomics in their senior year.